Attaching "disable_polymer=1" to the arguments in the URL will keep the page using the previous layout. Unfortunately though that setting doesn't carry over to other pages when you load a new one. I started off by looking at "Your First WebExtension" on MDN. This example is based around injecting scripts into pages, though, which isn't quite what I wanted to do. A bit of searching led me to "Intercept HTTP Requests"... which is more-or-less exactly what I wanted to do! After a few misadventures†, I put everything in a .ZIP file (as per "Package Your Extension") and called it a day. I've now uploaded it to the Firefox add-ons site, and have made the source code available on Gitlab.com. † PROTIP: Don't forget that your intercept-if-youtube.com logic will also catch any redirects to youtube.com... like, say, the ones with &disable_polymer=1 on the end that your code generates. Oops! I finally updated Kiniro to use the actual, final version of Rails 5.2.0 last weekend, having left it running on 5.2.0.rc1 for a while. I also fixed various strange RSpec/MySQL connection problems, and made everything Rubocop-compliant, which - for some reason - I apparently didn't do before. There are still a few things to do, but most of them are behind-the-scenes stuff, like improving the CSS for pages only logged-in users can see. I've been thinking about Morrowind again recently, so a few days ago I tried installing OpenMW - a cross-platform, open-source reimplementation of the Gamebryo engine it runs on. Installation was easy; OpenMW itself is available from the Debian package repository, so after downloading/installing the necessary .deb files I simply ran the launcher program, which copied everything from the retail CD to my hard drive before running the game. I've only just started playing with a new character, so I've barely made it out of Seyda Neen at the moment, but from what I've seen so far it works flawlessly - even on my ancient 2008-era desktop machine! If you're considering (re-)playing Morrowind, especially on a not-Windows OS, you might want to give it a whirl. After a long hiatus†, I've recently decided to look at the Flash file format again. I may write more about it at some point - there's certainly plenty of interesting quirks to discuss - but today I'd like to share something I learned about C preprocessor macros. † At time of writing, my last commit on the Vector2D project was just over three years ago. I'm not sure that this idea is enough to qualify for inclusion under the articles section; perhaps I should write up a more-in-depth explanation of this newspost at some point. Many years ago, The Game Creators (who, at the time, were mainly known for DarkBASIC and DarkBASIC Professional) ran a competition in partnership with Alienware. The rules were simple: Create a DarkBASIC game featuring the provided alien.3ds character model, and display the "Play it on Alienware" logo at some point. The winner would be rewarded with a free Alienware gaming PC. I didn't enter this competition, but I did download several of the entries to see what they were like. This was in early 2004, so I would have been about 17 years old, playing them on my old Toshiba laptop running Windows XP. 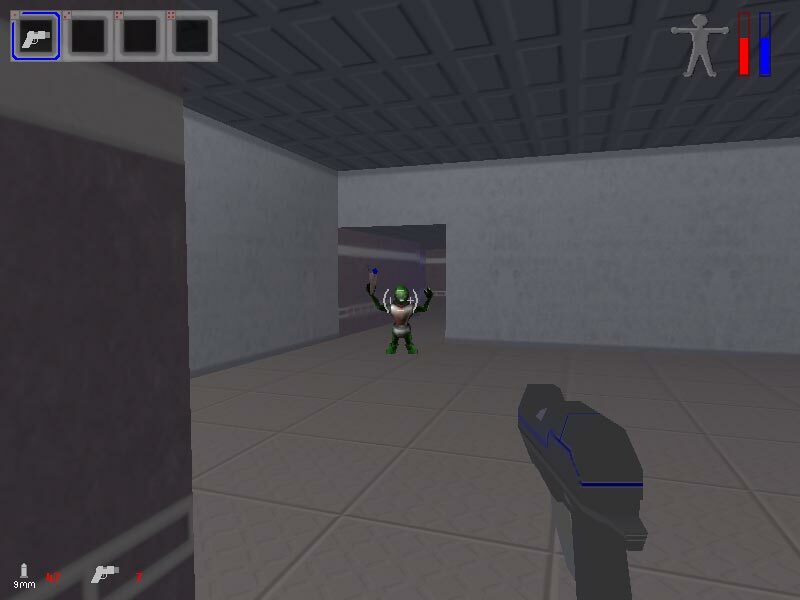 Star Thing was a neat little FPS in which you had to find passcodes for doors by reading notes scattered about the levels. You could only carry 4 items at a time (guns, health kits, and armour kits), so you had to carefully decide which things you took with you when travelling to the next level. It makes me think of System Shock II or Deus Ex, and I played through several times back in 2004. It worked just fine on Windows 7 when I tried it out today, so I made Matt play though it. Another cool little FPS, this one actually made it into the top 10 of the competition results. I couldn't get this one working under Windows 7 (it complained about a missing D3D-related DLL file), but there are quite a few videos of it on Youtube: one, two, three, four. Okay, so this one is a bit ropey compared to the other two, but that doesn't change the fact that I played it back in 2004. Plus, it's got a wonderfully DarkBASIC-ey feel to it! If the URL starts with http://files.thegamecreators.com, then it is still available today - just paste it into your browser address bar. If the URL starts with http://files2.thegamecreators.com, then it will still work today if you change files2 to files. This has been a public service announcement by the society of concerned citizens for DarkBASIC history preservation. Now, go and try out some of the other competition entries! I implemented file-uploading yesterday evening, so now we can add images and stuff. A few days later, and we now have the ability to post articles, plus a nice new CSS theme! This is done via highlight.js, something I came across a few years ago whilst writing Markdown-based documentation at CDL. I had to write some custom JS to account for Turbolinks events, but other than that it was pretty straightforward to set up. I couldn't get into work today due to traffic jams caused by a sudden snowfall overnight, so I've spent the day putting together a Rails 5.2 app and getting it up-and-running here on kiniro.uk. Rails 5.2 isn't officially released yet (I'm using the release candidate), but one of its new Killer Features™ is ActiveStorage, which makes file uploads a breeze out-of-the-box. I've previously been using the Paperclip gem for work-related projects, which works Just Fine, though it does require new database columns to be added in order to attach stuff to specific tables, whilst ActiveStorage does not. Anyway, that's all for now - things are still very incomplete, and I have to get everything ship-shape before I tell nginx to make this available on port 80.